The first copy of each program in this deck does not count against your influence limit. "New technology destroys the old." The Professor is (writing just before the release of All That Remains) widely considered one of the worst IDs. He has the lowest influence in the game, at 1, but is the most splash-friendly ID there is: Professor decks generally have more than a third of their deck from opposing factions. At present, most Professor decks end up looking a bit like Anarch GoodStuff with Shaper deck manipulation, plus Faerie and Sneakdoor. This is largely to do with the lack of good or high-inf Criminal programs to give more advantage to playing him: Sneakdoor, Faerie, Garotte and Savoir-faire are the only criminal programs with inf >2. His art shows the hexagons which frame all program cards. This (along with the ability text) is a very unsubtle hint: the Prof is all about the programs. Build a deck which supports and utilises good programs, has memory, econ and speed. At present, most Prof decks seem to be built around ProCon or Freelance Coding Contract. If you want to go for the latter, it's not too hard to have more than half your deck be programs. This is very fun. I am ... anomolous in believing the prof is good. But, you know, they say Account Siphon's the strongest card in the game, that it's best when the Corp doesn't see it coming, so the Runner who the Corp will least suspect of running Account Siphon (by virtue of not being allowed it alongside a few other cards) must be the best, right? The professor, as an identity, will only get stronger as more programs are released. 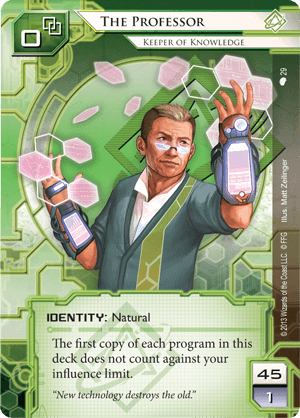 Upcoming cards like "Rex", and non-NRDB spoilers we've seen should continue to give Professors more program options make his ability work. Do you have enough memory and econ? What (if anything) do you want to spend your 1 inf on? (I'm a strong believer that "nothing" could be an acceptable answer -- deckslots are tight, after all.) Frequent answers include Stimhack, a second Femme or sucker. I've seen people try Easy Mark, BOX-E, a second Cache (I like), a Shard of your choice, Ms. Beckman, Oracle May, Express Delivery and Cyberfeeder. Are you getting enough out of being the Prof? A big criticism is that a Prof deck will frequently be a worse Kate, or a worse Chaos Theory. Count your influence. Are you playing more than 20-25? Can you work out a way to frame your deck better with other IDs? "New metas destroy the old"
How the winds of change blow. Prior to 2016; our humble Professor was considered a joke card. His text box ability only applies to deckbuilding: whilst he can include nearly any number of programs in his deck, anything out-of-faction could only be a one-of making pulling anything you need up unreliable unless you used SMC or Clone Chip. Anything that isn't a program is restricted to a single copy of 1 influence, and that is if you didn't use it to import an extra copy of a single influence program. Why would any discerning shaper player use him? Why restrict yourself to singles of good programs out of faction, when you could have multiple copies of the strongest of those programs and be able to tutor and recur them just as effectively? What can this guy do that no one else can? - What's his hook? Those questions now have an answer. For the unininitated, on Thursday, 31st December 2015, at approximately 18:00 GMT: Damon Stone, the new Lead Game Designer, made an inaugural change to the ruleset for tournament play to curb the use of certain overplayed cards. For better or worse, those changes are here, those changes are the NAPD Most Wanted List. So... What the heck does this have to do with our neighbourhood Mr. Rogers look-a-like? The mechanics of the NAPD Most Wanted List (i'll simply refer to as 'The List') are quite simple. Any card on The List reduces the total influence limit (that's the grey number in the bottom left) of the ID using it by 1 for each copy included in the deck. This reduction of the total influence limit is in addition to the influence cost of the Listed card itself. This reduction still applies even if you are using a Listed card which is in the same faction as the ID. An ID's total influence limit cannot be reduced below 1. There are no limits to the number of Listed cards that may be included in a deck, so long as you do not spend more influence out of faction than is allowed by your new, reduced total influence limit. Disregarding for now what is actually on The List, this has given our Professor a new 'hook'. Our Professor does not give a single hoot about this mechanic. He flat-out ignores it. His influence limit is already 1, so it cannot be reduced any further by Listed cards. He ignores influence on any out of faction programs, so his influence total being 1 does not matter in the same way as for other runners. meaning... He, and he alone can play unlimited numbers of cards on The List, he can play Listed cards in such numbers that no sane player would include in any other ID: most notably Listed neutral and shaper cards. So sure, he'll never be able to use Lucky Find, or The Source, nor will he ever afford more than a single copy of any non-program that is out of faction. But do you really need them? When you can delve into the NAPD's evidence locker and help yourself to as many Prepaid VoicePADs, Clone Chips and include such illicit digital gems as Parasite, Yog.0 and Cerberus "Lady" H1 in your collection, how much do you really care what is going on outside the walls of your University? "Oh these little things, Officer? I'm just using them for 'research' purposes only. I have all the paperwork signed off right here"
So, I've been working on The Professor for a while now. I have had increasing success with this "worst shaper" of ours in my local meta and on Jinteki.net, and one thing always strikes me as odd: people are consistently either surprised or pissed off when I win with the old man. "Why is this? ", I thought to myself. Why are we so unprepared for The Professor to win games? Why? Because he looked so cool when he came out! There we were, leading our gray boring lives, playing our gray boring decks. Then The Professor burst onto the scene, and we all had an amazing time stuffing a deck with every program imaginable as he took us on a journey through colour and fun. Then we played those decks, and they sucked. And so we went back to our gray, boring decks and our gray, boring lives. In my humble opinion, it is because he looks INTERESTING, but not POWERFUL, and the important word in that statement is "looks". When The Professor came out, Shaper was already established in what it could do. And since Creation and Control, every single shaper has had unique abilities lending themselves to certain types of deckbuilding. The Professor just fell between the grates, forgotten. What I'm getting at is that none of us took the time to actually tune the decks. Our collective Hivemind has produced some AMAZING decks over the years. The internet has tuned Butchershop and Noise to near-perfection. We have produced PrePaid Kate and and Foodcoats, decks so dominant the NAPD started hunting them. We got a card NERFED for crying out loud. Going back to the Professor, he is in a unique position as an ID. He has no clear strategy printed on him (like Kit, Noise or Geist) without being genreically powerful enough to build a goodtuff deck with (like Leela, Kate or Whizzard). Instead, he offers us a challenge unique among runners - he gives us ALL THE OPTIONS, and challenges us to use them to their full potential. He is unequivocally the easiest ID in the game to tune. You can add and remove programs with impunity, without worrying about influence. But that's just it: he requires tuning, and lots of it. He has one of the steepest learning curves in order to even function. Some decks have a "pick-up-and-play" feel, where you get what it's supposed to do and does it well. Others have a reversi-style, aka "a minute to learn, a lifetime to master". But the Professor is different. We need to stick with him. Tune him. Learn the nuances. We need to have our decklist memorized, our priorities straight, and learn everything we can about him. But once we've made it over that initial hurdle, you will find a runner who can do anything, beat anyone, and solve any problem. Behind the "bad" exterior lies a world of possibility we just need to find out how to get to. So I urge you to give him a chance. Challenge yourself. Build a deck, and resist the urge to dismantle it after one game. Instead, remove the cards that didn't work and add what you need. Rebuild him. Tune him. Become his friend. If you do, you will feel The Professor come alive in your hands as you realize everything he's capable of. With many changes in so little time (rotation, revised core set, MWL 2.0), the game unfolds to a whole new set of possibilities that yet have to be charted individually. Among them, it must be highlighted that with MWL 2.0, the concept of universal influence introduced with MWL 1.2 is gone and the latter was a showstopper for the professor, given that the then restricted cards counted among your deck's influence, insteading of reducing your ID's influence to minimum 1. Nice review but this card is flawed so much, you should use it as divider in the box. No splashed events/hardware/resources more expensive than one ergo: you play the game with your pants down, mostly shaper cards and that very slowly. Every other ID is better and that's not gonna change because of a new breaker suite or what not.